Life is hard and the key to survival is learning how to deal with failures. Since man first started to use tools and build machines, we have had to learn to deal with failures. If a tool or machine broke, we could either repair it or replace it. The choice has always boiled down to a matter of resources. If we had the resources to fix it (tools, materials, time), we might choose that option. If unrepairable and we had other resources (money), we might buy a new one. But as our tools and machines become more complex and the places where we use them become more remote, our ability to keep them running becomes more a matter of ingenuity. New designs for exploring the depths and breadth of our planet and others, force us to look carefully at designs for survival. Whether we’re traveling to the stars or to the crushing depth of the seas, we will have limited resources at our disposal and so we must have a well-designed approach to make use of those resources. As it turns out, nature provides us with some pretty intriguing strategies for survival. Some of these are being explored and applied to the problems of survival during oceanic and interplanetary exploration. Another strategy for dealing with a failure, is to regenerate or replace the failed part. Our bodies do that all the time. Cuts, broken bones and bruises will all heal given time and the proper resources and environment. But if we lose an appendage — a hand, arm or leg — it’s gone and we can’t regenerate it even though the “blueprints” for that part reside in our genetic coding. For some creatures, however, the regeneration concept is the key to success and, in essence, another strategy for survival. Let’s take the iguana, for example. Try to catch an iguana and you’ll likely find yourself chasing it from behind. And they are quick. Should we be fast enough to grab that iguana by the tail, we end up with exactly that — a piece of iguana tail. The iguana gets away and regrows its tail, making ready for the next escape maneuver. Another creature with a well-honed capacity for regeneration is the sea star. For a sea star, retaining its symmetry is not critical for getting around. But in the long run, it needs multiple arms for survival — to move and to pry open mollusk shells — so it regenerates those arms if they become lost or damaged. If we don’t have the capacity for regeneration, the next best thing is to carry a spare — another strategy well known to divers. Considering the importance of breathing, we might bring along an extra cylinder and a spare regulator in case our equipment develops a problem. When night diving, we bring along an extra light or two in case our primary light source fails. In fact, for all our diving, we generally bring along a whole extra diver — our buddy — to help us out if something else fails or goes wrong. When it comes to locomotion, one characteristic that is often quite critical is symmetry. Just imagine trying to row a boat, but with a single oar on one side of the boat. Like a diver with one fin, we might find that form of locomotion to be rather inefficient, unless we want to go in circles. Indeed, symmetry is important and, often times, the more sophisticated or complicated a design becomes, the more we find that symmetry is important. Imagine a typical car with four wheels, each of which is secured to the vehicle with four nuts. Now let’s say we lose the nuts for one wheel. It might at first seem like a serious problem. We obviously can’t drive the car with only three wheels. The lack of symmetry makes it very unstable and, unless we have some spare parts at our disposal, we might be out of luck. But there is a unique solution to the problem: reconfiguration. If we remove one nut from each of the remaining three wheels and use those to secure the fourth wheel, we can continue to drive with relatively little impact to our speed or safety. We really haven’t consumed any additional resources: we’ve just reconfigured those that we have. For more complex systems and more confounding scenarios, the problem of a propulsion failure might be less simple to resolve. Take the example of a sleek twin-engine airplane. The pilot (and passengers) enjoys the confidence that comes with two engines and the ability to continue flying should a problem develop with one of them. But when one of those engines fails, the effort needed to manage that airplane and maneuver it safely and effectively become drastically more complex. Drag from the “dead” engine tends to turn the aircraft to that side, as does the thrust from the remaining good engine. But there is more. The propellers push air over the wing behind them and that creates more lift. But when an engine fails, that lift diminishes, and now the airplane wants to roll over in the direction of the failed or “dead” engine. To keep the aircraft flying straight, the pilot must apply rudder in the opposite direction and use the ailerons on the wings to “raise the dead” — lift the wing on the side where the engine failure occurred. The pilot has still more to worry about. With only 50 percent of its propulsive power remaining, the aircraft may lose its ability to climb or even maintain altitude. To be sure, it’s time to conserve as much energy as possible and it’s also important that the airplane present a clean aerodynamic profile as it moves through the air. If it is moving through the air at an angle, the fuselage presents a much larger surface to the air, which creates much more drag, often causing the aircraft to lose altitude. Clearly, the problem of asymmetric propulsion is a serious one for the pilot who must readjust the angle at which the aircraft moves through the air in order to stay in the air. Wouldn’t it be convenient if the pilot could somehow slide that good engine to the centerline of the airframe to balance out the aerodynamic forces and make the aircraft more efficient? As it turns out, that is one problem for which nature has developed an unusual solution. Meet Aurelia aurita, the common moon jelly. Easily identifiable from above by their four moon-shaped gonads visible through their similarly moon-shaped transparent bell, these translucent globs of gelatinous goo can grow to 15 inches (38 cm) in diameter. A fringe of small tentacles line the edge of their bell, with four longer tentacles in the center used to catch their prey. 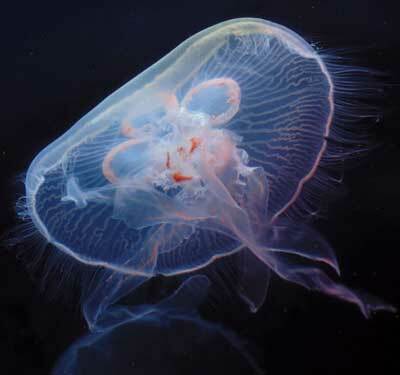 Moon jellies live in temperate and tropical waters and are often found in quiet bays and harbors where they feed on planktonic species including mollusk and crustacean larvae, fish eggs and other small jellyfish. Moon jellies are themselves a staple of sea turtles, sea birds and various fish species. Like other jellies, moon jellies propel themselves by pulsating their bodies and flapping their tentacles to push water behind them. To accomplish this with any modicum of efficiency requires the radial symmetry that is their signature design. But should a passing sea turtle lop off part of the moon jelly’s bell or any of its tentacles, the poor jelly would begin swimming in lazy, clumsy circles due to its off-centered thrust. The moon jelly has a unique solution to this problem of asymmetric propulsion experienced when a predator (or accident) causes the loss of tentacles. As it turns out, moon jellies have a unique ability as shapeshifters. Rather than regenerate or re-grow the missing or damaged anatomy, it simply reconfigures its semi-solid form to achieve a new symmetrical shape. And why does the moon jelly rearrange its geometry rather than re-grow the missing part? The answer may come down to energy and the efficiency of movement. Just as the pilot of that twin-engine plane must readjust its aerodynamics to conserve its limited power, the moon jelly must also be energy conscious. While it might be nice to grow the missing part back, doing so takes a lot of energy that simply may not be available. For the moon jelly, it takes less energy to simply rearrange the parts in its gelatinous body into a new symmetrical and hydrodynamically efficient configuration and keep moving along on its journey. Are thought to have been in existence for millions of years and have evolved into some 1,500 species. Are found in every ocean, typically where temperatures range from 41 to 66 degrees Fahrenheit (5 to 19 Celsius). However, they can adapt to survive in temperatures from 21 to 88 degrees Fahrenheit (-6 to 31 degrees Celsius). Create toxins in their bodies to deter predators. Are composed of 95 percent water. Are increasing in numbers most likely due to climate change and overfishing of their predators. What to Bring and What to Leave Behind? When we’re talking about long distance or long duration exploratory expeditions, we need to think carefully about what to bring along with us to deal with failures. A simple fact of life is that we can’t take everything with us, and that’s especially true for any form of extended exploration. If we can only carry so much, we had better focus on bringing along only those limited resources that will likely be most important. 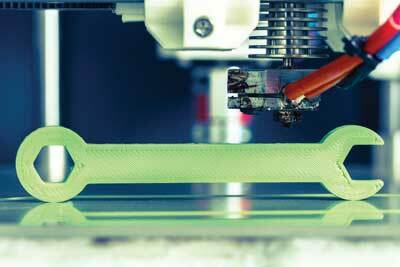 New technology such as 3-D printing to could have applications in the production of diving equipment. For manned exploration, one way we can minimize the problem of mechanical failures is to bring along a repair shop with the tools and spare parts we might need. But for a long journey and complicated machines, that strategy may become impractical. What might break? How many spare parts do we need? Which parts can we make ourselves if we have the right tools? What materials will we need in order to make those parts? What skills and knowledge must we have in order to construct the needed replacement parts? For a manned vehicle, one solution to the repair parts conundrum is the application of 3-D printing technology and that’s an avenue currently under consideration by engineers and designers in many realms. In fact, with the advances in materials technology, the nuclear power industry is exploring the use of 3-D printing to manufacture repair parts for power plants. Not only is it a cost-savings strategy, it dramatically reduces the time it takes to obtain a replacement part. For those exploring the outer edges of the galaxy or the remote regions of the ocean where replacement parts are hard to come by, having 3-D printing capability to generate new parts is a game changer. Such technology could even have an application for divers. Just imagine the potential for diving in remote regions. An equipment failure might bring our diving to a screeching halt. But with the technology to “print” a new part, we could be back roaming the reefs in a matter of hours. Engineers are studying propulsion in planktonic creatures in order to develop more efficient unmanned underwater vehicles. For unmanned or robotic vehicles, it is less likely that they can repair, replace or reconfigure mechanical and structural elements. More often, survivability lies in the ability of software to shift power from one system to another, to actuate mechanisms or to operate systems in a different manner or mode. So let’s say our ocean-roaming robot loses its propulsion capability or, at best, is very diminished. Is there a way to survive — to continue the mission and get to its destination — despite the failure? Here designers and engineers can take another lesson from the moon jellies, adopting a planktonic mode of transportation to conserve energy. The trick is to regulate buoyancy and control depth so they can use the currents to take them where they want to go. In fact, that’s the way a hot air balloon navigates. Since the direction of the wind varies with altitude, the pilot of a hot air balloon can steer a course to a considerable extent sim ply by adjusting its altitude. The same strategy can be applied to an un manned underwater vehicle (UUV). By merely adjusting its buoyancy — which takes much less energy than normal propulsion — the UUV can take advantage of the difference in current direction with depth and steer itself on a desired course by controlling depth with buoyancy. When a UUV becomes entangled, the iguana’s strategy might be the best option for survival — leave a piece behind so you can escape. Perhaps having the ability to jettison an entangled manipulator or other appendage is a way to save the vehicle and complete the mission. When something fails, we often have to make a choice with regards to our limited resources and determine how to use them to our greatest advantage. By keeping in mind that the priority is survival, we can allocate our resources to best accomplish that goal. In the 2015 blockbuster adventure film The Martian, fictional astronaut Mark Watney (played by Matt Damon) is the quintessential survivalist who struggles with failures on a daily basis cannibalizing, reconfiguring and repurposing materials, parts and life-sustaining resources to gain an edge in a high-stakes survival game. The film, based on the novel of the same name by Andy Weir, gives us a well-researched glimpse into the survival strategies revolving around resource allocation. Watney, who had been left behind on Mars and presumed dead, must devise a means to survive some 560 sols (Martian days) and travel to a distant launch site with limited food, water and oxygen. To accomplish this, he cannibalizes and re-purposes equipment to provide the needed warmth, electrical energy, oxygen generation, carbon dioxide removal and drinking water. He gambles precious resources to search for an abandoned probe to repair its communications equipment and re-establish communication with Earth. Likewise, he chooses to use precious nutritional supplements in an attempt to grow food. It’s a complicated puzzle that he must piece together as deftly as a chess master in a world tournament — only the stakes are life and death. Although our personal prospects for a Mars expedition may be rather remote, it is easy enough to imagine Earth-bound adventures that would require the same type of clever resource re-allocation in order to survive in the wilds. Imagine traveling alone across the desert (on our way to the coast, no doubt for some diving) when our car breaks down. Fortunately, we have a couple gallons of water with us for emergencies and we expect that will last long enough to resolve our breakdown and get out of danger. We try calling for help, but of course there is no cell service. Checking under the hood, we discover that a radiator hose has failed allowing all the engine coolant (a mixture of water and glycol) to leak out. So here is our dilemma. We know we can only survive for a limited time with the water we have, so we need to escape the desert before it runs out. We could use the water for drinking and hope we can walk out of the desert before we run out of water. Or we could fix the leak using some duct tape and hose clamps, use the water to re-fill the radiator and then drive out of the desert. We might worry as we pour the last few ounces of our life-sustaining water into the radiator that the car still might not run, leaving us stranded without drinking water. So we wonder, which is the best choice? Or imagine being cast away on the ocean in a life raft with just a few rations and a piece of canvas. Do we eat the limited food we have or do we pull a “Watney” and use it as bait to catch fish? And what would we do with that canvas? Would we make a sun shelter, devise a sail for propulsion or make a funnel to catch rainwater? It’s these types of choices that must be evaluated when failures occur that put our survival at risk. The logic to sort through such choices may need to be programmed into the software of autonomous spacecraft designed to travel in remote regions of space — or autonomous underwater vehicles designed to roam the expanses of the Earth’s oceans. Even as divers on our short duration forays into the deep, we’re constantly faced with a multitude of questions about failures and survival: How much extra air do we need? What extra gear should we carry? What spare parts need to be in our save-a-dive kit? How do we work with our buddy to limit risk and preserve our precious resources? 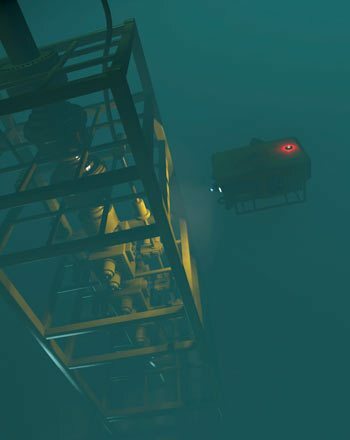 Long-duration exploration, whether it’s beneath the waves or among the stars, is a daunting proposition when we consider what might go wrong. We might never learn how to grow new body parts, but we’re learning new ways that can help us meet the needs of long-range exploration. 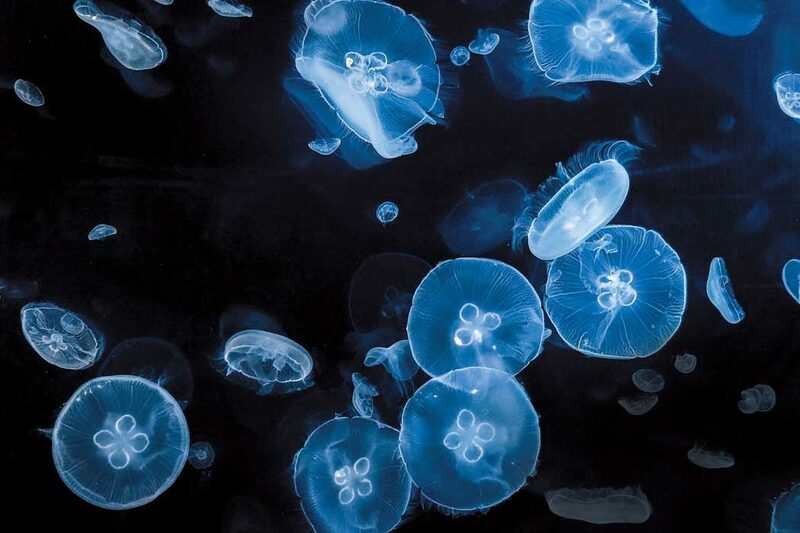 By developing new strategies and, using some clever examples from nature, perhaps we can improve our abilities and learn to adapt and survive as cleverly as the moon jelly.